The scientific work performed at the MRCAT sector is broadly materials oriented. The main emphasis is on in-situ studies of materials by x-ray spectroscopy, scattering and reflectivity. There is a strong environmental science component to the research. We have fabricated an initial design of a bent Laue crystal optic for use in removing harmonics and subharmonics from a high energy (>40keV) beam. We often need high energy beams (up to 80keV) for powder diffraction and pair distribution function experiments. These energies are obtained by using the (333) reflection of the Si monochromator crystal. The beam that comes into the hutch, therefore, contains not only the desired energy E but E/3, 2E/3, 5E/3, 7E/3, 3E, and so on. X-ray mirrors will not work above about 30keV and in any case a mirror cannot remove the undesirable, and intense sub-harmonics. By using a bent crystal diffracting from the (111) planes, it is possible to remove all the undesired energies except the 3E (which is not very intense for E=80keV). We have done initial testing of this device and measured a nearly 70% reflectivity of the desired energy at 80keV. In the upcoming runs, we will attempt to measure powder diffraction patterns and pair distribution functions using this device. We expect it to become an integral part of the beamline in the next year or so. It is established that the alloy composition x plays a crucial role to determine the physical properties of the colossal magnetoresistance (CMR) materials, R1-x Ax MnO3 , where R is trivalent rare earth and A is divalent alkaline metal cations. Random substitution has been generally assumed for R and A ions theoretically, but yet not experimentally verified. In this study, we chose a canonical CMR material, La1-x Srx MnO3 , and studied in detail about Sr and La environment by x-ray absorption fine structure (XAFS), focusing on the issue about this random substitution. Our measurements reveal a consistent deviation from a random distribution of Sr at the La/Sr sites for x » 0.3 . Local structural disorder on the cation sublattice in the low-x samples is also observed to differ in the vicinity of the La-rich and Sr-rich clusters. The local clustering and structural disorder establish an intrinsic chemical as well as structural inhomogeneity on the nanometer scale, which may provide a mechanism for the nucleation of magnetoelectronic phase separation. In this work, XAFS is used to determine the site of residual As in wet-oxidized Al0.96 Ga0.04 As. In a ~ 0.5mm oxide film removed from its GaAs substrate, the remaining As atoms are found to be coordinated with oxygen in the form of amorphous As oxides, with a mixture of 80% As3+ and 20% As 5+ sites that are locally similar to As2 O3 and As2 O5 . No evidence of interstitial or substitutional As, As precipitates or GaAs is seen, implying that less than 10% of the As atoms are in these forms. In related work, x-ray reflectivity and reflection-mode XAFS have been used to study the interface in the same sample series without the substrate removal. These measurements show the same mixture of As 3+ and As 5+ sites, but in addition show the different oxides tend to segregate into layers in the oxide film. XAFS has been used to study silver (Ag) deposited on gold (Au) nanoparticles suspended in aqueous solution, with various Au core size (2.5 - 20nm in diameter) and degree of Ag deposition. Our results show that the room temperature interdiffusion of Au and Ag increases rapidly with decrease of the Au core size, and several atomic layers of diffusion is observed for nanoparticles with the total size below 8nm. Some of this effect is expected: The melting point of the particles also drops quickly with smaller particle radius. However, the observed size dependent alloying is inconsistent with size-dependent diffusion coefficient alone. Possibly additional effects such as the defect migration may also play a role, an molecular dynamics simulations are currently underway to gain insight on the system. In developing new methods of environmental remediation, it has become crucial to understand the transport of metals. Aqueous metal ions come in contact with a variety of mineral and biological surfaces on their way in the subsurface, and interaction with both must be well understood. Adsorption to the mineral surface has been relatively well studied due to the amenability of minerals to conventional structural characterization methods, but little is known about the metal-to-bacterial cell wall interactions. Bulk experiments show that cell biomass can efficiently adsorb metal cations, making it a significant factor in transport modeling environmental cleanup of many sites. In this work, the local atomic environment of aqueous cadmium bound to the cell wall of the common groundwater bacterium Bacillus subtilis was determined using X-ray absorption fine structure spectroscopy. Samples were prepared at several pH values in the range 3.4 to 7.8, and the functional groups responsible for the adsorption were identified. Results indicate that cadmium binds predominantly to protonated phosphoryl ligands up to pH 4.4, and at higher pH adsorption to carboxyl groups becomes prevailing. At pH 7.8 the onset of another binding mechanism is observed which we tentatively ascribe to phosphoryl ligands. EXAFS spectra of several cadmium acetate, phosphate and perchlorate solutions were measured and used as standards for fingerprinting and to assess the ability of theoretical modeling of the carboxyl, phosphoryl, and hydration environments. The final results of this XAFS study corroborate the bulk-sorption experiments and proposed equilibrium complexation model by Fein et al. The measurement of EXAFS spectra of temperature programmed reduction of Cu-ZSM-5 was the first project to take advantage of the newly developed capability to run fast EXAFS scans from 10 seconds to several minutes. We were able to monitor the changes in oxidation state and chemical coordination as a function of temperature and correlate these results with other, more standard, catalyst measurements. Subsequent analysis of the data revealed the underlying causes for the functional catalytic temperature range of several tested materials and will lead to the development of better catalysts. We have had great success studying battery materials, in situ, even before the development of truly fast measurements. In particular, we have most recently studied intermetallic electrodes, a category of anodes that could potentially replace graphite-carbon in lithium batteries. The most studied, to date, is InSb, typically thought of as a semiconductor, although, when a small amount of lithium is added, becomes metallic. In Situ measurements have shown how the Li first intercalates into the open zinc-blende lattice, and then replaces the indium in the structure, extruding fine deposits of indium metal. Reversing the current, amazingly, reverses the process, and In is once again replaced in the zinc-blende lattice into its original position. This study has helped us understand the mechanism for InSb anode failure and the voltage limits for using this material in a real battery. One of the advantages of using a synchrotron for x-ray diffraction is the high-degree of collimation of the x-ray beam. This collimation allows very high-resolution measurements of the diffraction pattern, difficult, if not impossible to achieve with a laboratory source. The other tremendous advantage is the tunability of the wavelength. Using both features, we were able to make high-resolution x-ray diffraction measurements of silver-sheathed multi-filament superconductor wires made by American Superconductor. Traditionally, measurements of these wires are made by carefully stripping the silver sheathing away, and exposing the filaments. By tuning the wavelength to where silver is nearly transparent (below an absorption edge), we could study wires without destroying them. The high brightness of the insertion device line, allowed a thorough study of many locations on several wires, revealing details of the manufacturing process control: uniformity, texturing, grain size, impurity phases, and the extent of conversion to the superconducting phase. Synchrotron-based analytical methods are being used at the MRCAT beamline to establish the speciation of actinides in environmental samples. Emphasis is on the development of improved experimental methods and the application of these methods to a wide variety of samples. Significantly, initial theoretical and experimental efforts were focused on the relationship between XANES edge position and actinide oxidation state since this is a key parameter in understanding the subsurface chemistry of multivalent actinides. A correlation between oxidation state and edge position was observed for plutonium when the edge po sition was determined by the half-height of an arc-tan fit to the EXAFS region of the spectrum. Theoretical calculations also show that the oxidation state is much more significant than molecular geometry in determining the XANES edge position. Recently XAFS has been applied to the analysis of these environmental areas: precipitation of plutonium by zero valent iron, the sorption of Am 3+ onto Wellenburg colloids, and the sorption of NpO2+ on soil bacteria. Fluorescence maps representing the micron-scale distribution of iron-bearing minerals in a Fe-poor calcium carbonate matrix have been obtained at Sectors 10 and 13 of the APS. Micro-XANES and XAFS generated for those anomalies at the iron absorption edge allowed discrimination between mineral phases. The method should lead to a new understanding of the composition, grain size, and distribution of Fe minerals contributing to the magnetic properties of natural sediments. The fluorescence maps also aid in the localization of the magnetic grains by conventional microscopy techniques. We expect these initial results to lead to a new understanding of the origin of naturally-occurring magnetic grains, and the process of acquisition of magnetization in sediments and sedimentary rocks. These are important challenges in view of the role of sediment magnetization in the generation of geologic time-scales. 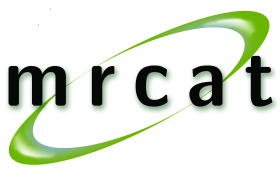 A high-brilliance synchrotron radiation source such as the MRCAT beamline can be used to take comparatively fast in-plane diffraction scans to follow a surface reaction in-situ. The alkyl chains in n-octadecyltrimethoxysilane (OTMS) spread on a clean water subphase self-assemble in small domains showing a characteristic in-plane spacing. We have performed in-situ GIXD studies of this system and observed the time evolution of the polymerization reaction as a function of pH. The presence of a distinct diffraction peak even at the very early stages of the reaction gives insight into the mechanism of the polymerization. These experiments show the potential of this technique for the study of surface dynamics. Wit optimization of the experimental setup, we exepct to be able to significantly reduce the time required to take measurements and further extend the technique. We have performed the first successful XAFS experiments on an operating polymer electrolyte membrane fuel cell. This kind of experiment has not been possible at second generation sources because of the very small signal and the significant fluctuations in incident intensity caused by water and bubbles flowing in the cell. By taking data in under two minute scans, we have been able to obtain consistent analyzable data at both the Pt and Ru edges of conventional anode catalysts. Both virgin and conditioned fuel cells were studied in detail over the low-current, catalyst activation, region in the presence of pure H2 and H2 /CO fuels. An initial paper discussing the changes in the electronic states of the Pt/Ru materials as a function of cell conditioning has been submitted. We plan to extend the technique to novel catalytic materials. File translated from TEX by TTH, version 2.92. On 10 Jan 2002, 16:39.